Ships tomorrow if you order in the next 23 hours 52 minutes. Auto Ship & Earn + 105 Points What's this? 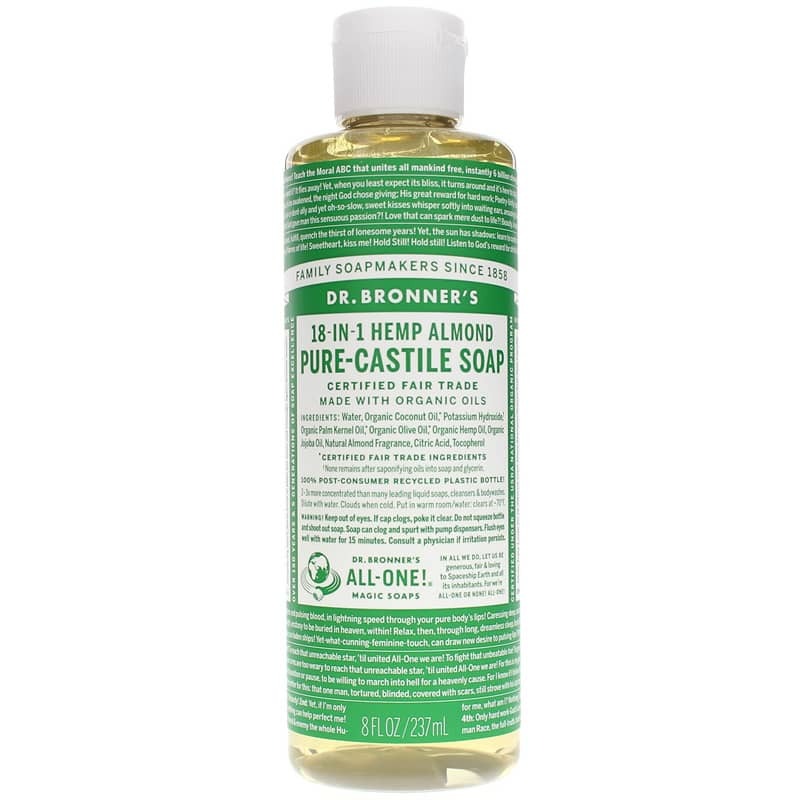 18-In-1 Hemp Pure Castile Liquid Soap Lavender by Dr Bronner's Magic Soaps is a wonderful choice for use just before bedtime or to start your day out with a tranquil peace of mind. A woody shrub native to the Mediterranean but grown worldwide, lavender has a sweet, smoky, floral smell and distinctive bright blue-violet flowers. This certified Fair Trade soap provides this relaxing fragrance to help tired, stressed-out souls. It may help calm calms nerves while soothing your body. All oils and essential oils are certified organic to the National Organic Standards Program and are packaged in post-consumer recycled plastic bottles. 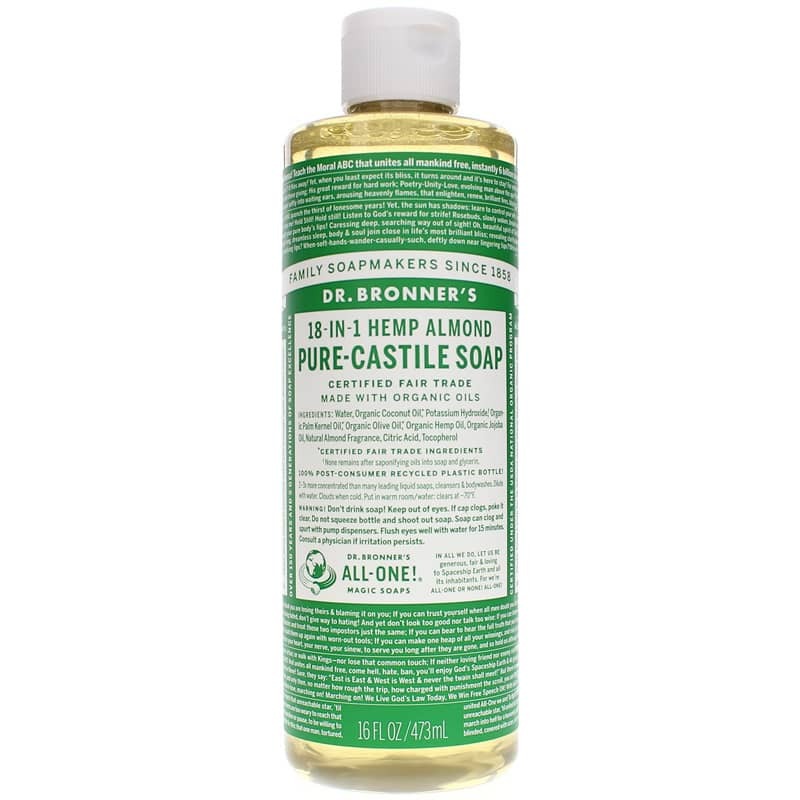 Dr Bronner's 18-in-1 Hemp Pure-Castile soaps combine organic extra virgin coconut, olive, jojoba and hemp oils with pure essential oils. The result is a soap that cleans effectively without being aggressive and produces a velvety-lather that leaves your skin silky-smooth and refreshed. Domestic cleaning: dilute from one part soap into 40 parts water for light cleaning or use full strength for heavy-duty grease-cutting jobs. Water, Organic Coconut Oil*, Potassium Hydroxide(1), Organic Palm Kernel Oil*, Organic Olive Oil*, Lavandin Extract, Organic Hemp Oil, Organic Jojoba Oil, Lavender Extract, Citric Acid, Tocopherol. (1) None remains after saponifying oils into soap and glycerin. Bath: Completely depends upon water amount, but roughly 2 Tbsp. soap in an average sized tub. (Doesn’t bubble, but still cleans). Foot Bath: 1-1/2 tsp. in a small tub of hot water. Dishes (handwashing): Pre-dilute 1:10 with water. Squirt on a scrub brush and scrub dishes. Laundry: 1/3 - 1/2 c. of soap for a large load in a normal washer. Add 1/2 c. vinegar to the rinse cycle. Use half of these amounts for HE. Fruit and Veggie Rinse: 1 dash (approx. 1/4 tsp.) in a bowl of water. Dunk produce and swish. Then rinse in clear water. Plant spray for bugs: 1 Tbsp. in a quart of water. Add dash of cayenne pepper if desired. Keep out of eyes. If cap clogs, poke it clear only. Do not squeeze bottle and shoot out soap. Soap can clog and spurts with pump dispensers. Flush eyes well with water for 15 minutes. Consult a physician if irritation persists. I bought this 32oz bottle of Dr. Bronners peppermint soap when I went back to school last fall. You only need to use very small amounts as it is very concentrated, I still have some left and its the end of summer! This is the best soap out there! 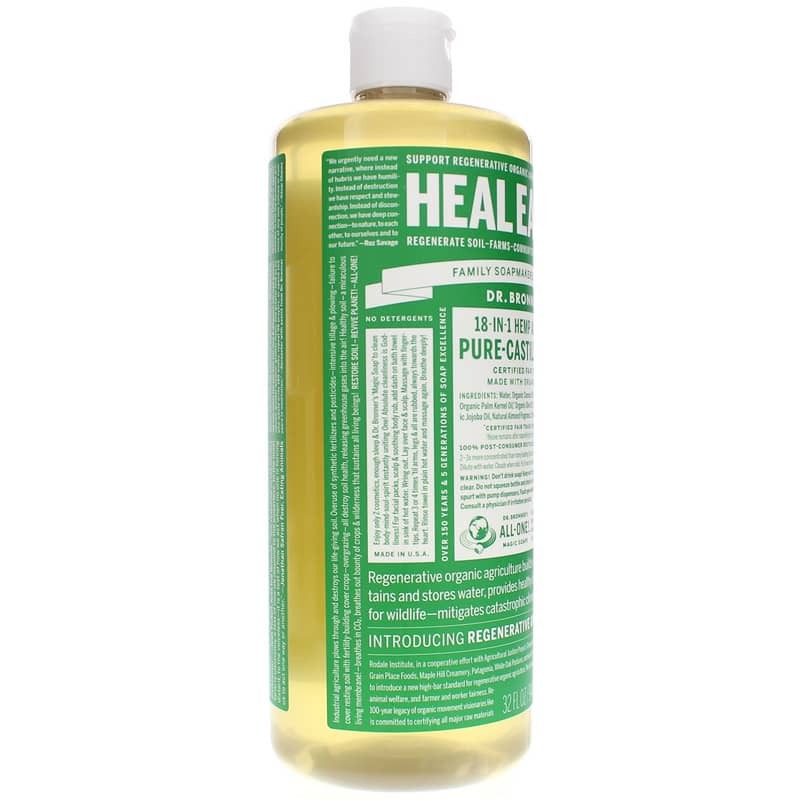 18-in-1 Hemp Pure Castile Liquid Soap PEPPERMINT smells great. I liked the soap, been wanting to try it for a while. I have only been using goat milk soap for some time now. This is a nice alternative to throw in the mix every once and a while. I will say that I wished the lavender scent was a tad stronger than the hemp scent. I love this unscented soap its great! When I want a scent I can add a soothing essential oil. I also love that I can re-fill my bottle in-store! Natural Healthy Concepts sells Dr Bronners soap for half the price I can find locally. Also the best price I could find online. Plus they have super fast FREE shipping. And I can pay with PayPal which I prefer. What's not to love?! This is my favorite Bronner soap; the scent is excellent, and a little goes a long way! Of course I love all natural products....but only if they work! This one does. It does not dry out my hands. I love unscented. That's the smell of clean to me! Unscented liquid Castile soap is the only product I use to bathe my pets & also for my family. It is so gentle on the skin, has no added chemicals or substances that are not needed to get perfectly clean. 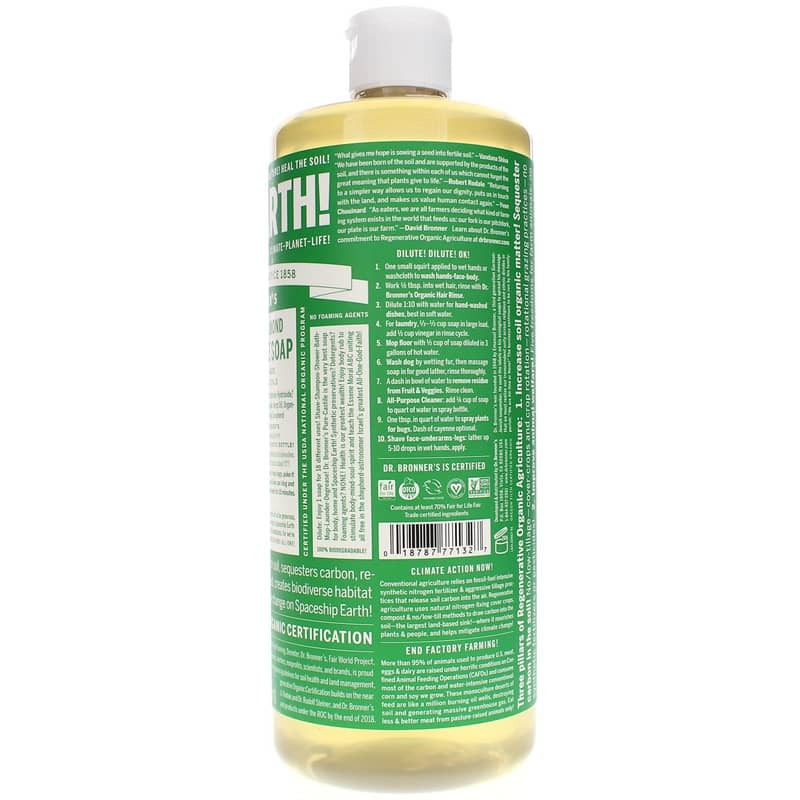 I love Castile soap! I love this soap it lasts me several months and I like to use it for many things not just showers, I brushed my teeth with it once and it was kinda strange but overall ok! I prefer the LAVENDER formula vs the Peppermint because the peppermint tends to burn & off set my ph easily. I ordered the ROSE formula once and it kinda smells like vomit to me. I asked a friend and she confirmed the slight vomit scent to the rose soap. This is the only soap you need. Dr. Bronner's: the second greatest bottled soap in the world (behind Rainforest Solutions, aka Osa Natural out of Costa Rica). Unscented is the only way I go anymore with Dr. Bronner's. 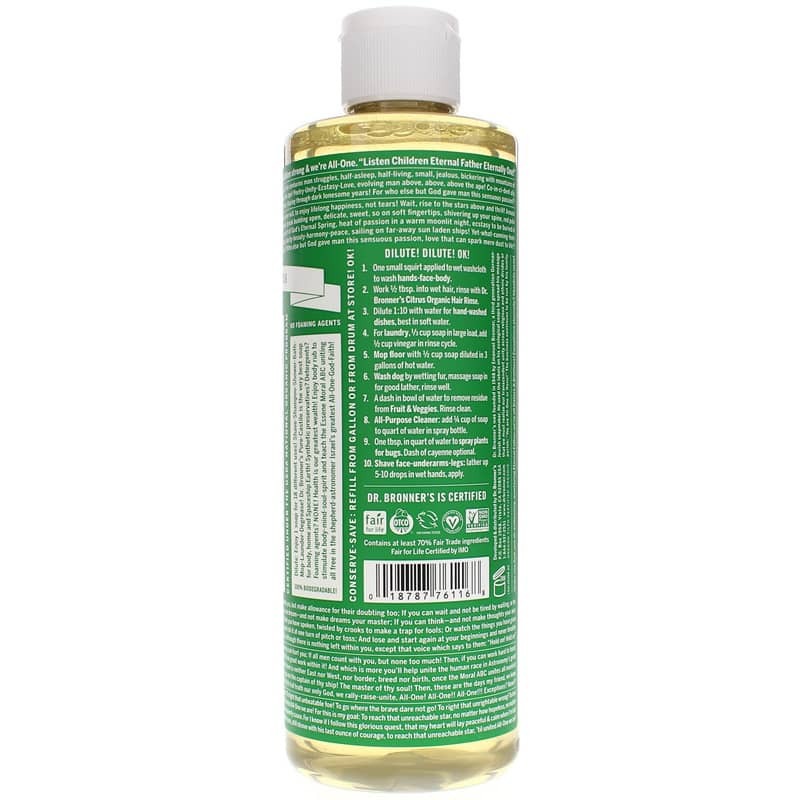 As a youngster I found unscented boring, now, Dr. Bronner's unscented liquid soap is a no-brainer. I love this soap for all uses. My whole family uses it. It is mild yet effective and no bad chemicals. I received my order complete and on time. Mail saved me two hours of driving so I will use Natural Healthy Concepts again in the future. My family and I have been enjoying Dr Bonners soaps for years. They lather nicely, smell wonderful with the oils used and leave the skin feeling squeaky clean - Whenever I use a 'regular' soap product (if I ever run out of Dr Bonners) I am rinsing and rinsing to get the residue off my skin. I also love how refreshing the scents are! You won't be disappointed! 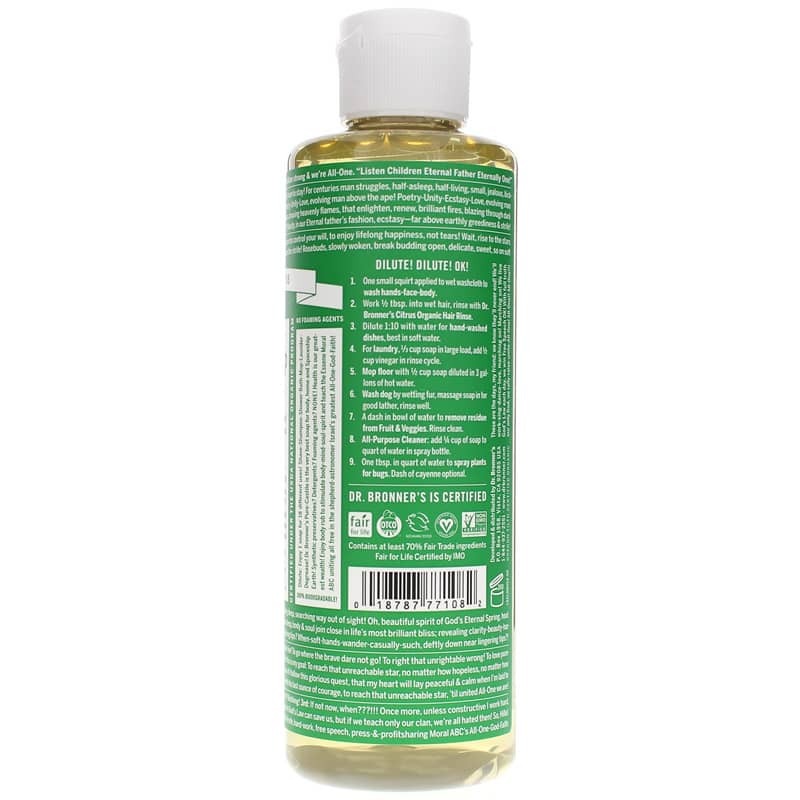 18-in-1 Hemp Pure Castile Liquid Soap fm. A little goes a LONG WAY, Excellent product. 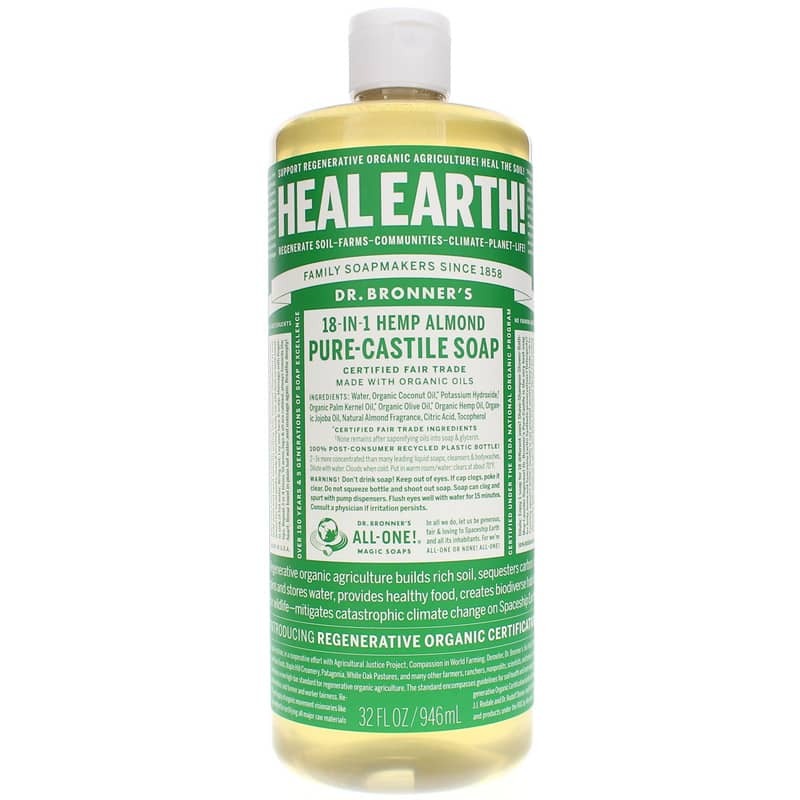 Dr. Bronner's castile soap is a staple for every house. I've tried several scents, but always go back to peppermint--it is cool and refreshing, and peppermint has natural anti-bacterial and healing properties. I use it as a face wash, body wash, hand soap refill, makeup brush cleaner, etc.Just remember to dilute!